The intelligent and versatile Ridgeback is truly adaptable and can compete successfully in just about any performance event his owner would like to attempt. 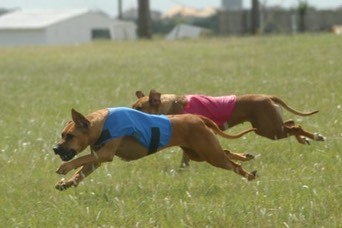 Lure Coursing is the event most similar to the hunting activity the breed was developed for. 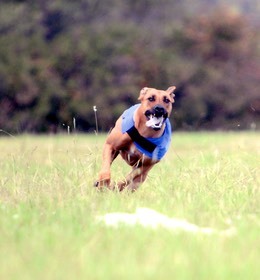 Ridgebacks excel at this sport which tests the instinctive sight hound traits of various breeds such as Afghan Hounds, Whippets, Greyhounds, etc. In a group of three the hounds chase the "plastic bunny" around a pre-determined course. They are scored on speed, enthusiasm, agility, endurance and follow. Pheron's first accomplished coursers were Rosie and Kalehe from our second litter out of Chani and Bowfield. Kasai was a top performer that produced Gilda and MacLeod who both achieved Field CH titles. Sanyati - from Gilda's first litter - was also a great courser. We now have Darcy and Joni exhibiting great enthusiasm on the coursing field. The dynamic mother and daughter duo - Gilda and Sanyati - also loved agility. Agility is a sport designed to demonstrate the dog's willingness to work with its handler. Dog and handler negotiate an obstacle course racing against the clock. This a very athletic event that requires conditioning, concentration, training and teamwork. Sanyati and her owner Mike competed very successfully achieving Master Excellent Jumpers with Weaves and Agility Excellent titles. 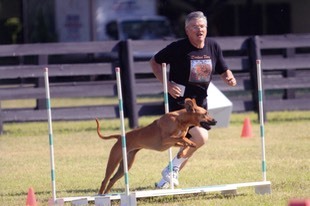 Gilda's breeder Mike Miller especially enjoys competing in performance events with his Ridgebacks. He trains diligently for agility and obedience and even sets up a mini lure course on his property for his dogs to practice on. Mike convinced me to work toward Gilda's Companion Dog title by competing in Obedience trials. 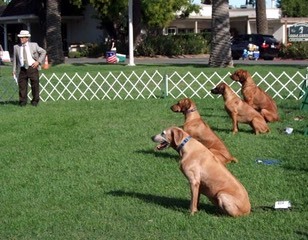 This is an AKC event where dog and handler teams are judged on their ability to execute a series of specified exercises. Gilda and I took some training classes and at the age of eleven she started competing in trials. We achieved her CD title and as a result Gilda was awarded her Versatility Certificate from our parent club RRCUS. It was a great feeling for me to accomplish this and made Mike very happy to have mother Kasai, daughter Gilda and grand-daughter Sanyati all with Versatility Certificates!